Message from the President, Brora Golf Club; a links course. At Brora Golf Club we are always ready to offer a highland welcome to our members and visitors alike. Our famous links is recognised as being one of James Braid’s finest pieces of work. The green staff work tirelessly to preserve the original design whilst presenting a course that is regularly acclaimed for its quality. The perfect balance between challenge and fun and in a breath-taking setting but do not take our word for it, see what others are saying about the course on Tripadvisor and Social Media. 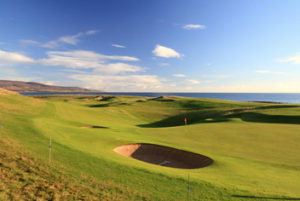 Our clubhouse provides a spectacular view of the golf course and surrounding links land and our attentive staff are on hand to make sure your visit to Brora Golf Club is enjoyable. Refreshments are available from the bar, food is available from the restaurant and our Pro Shop will take care of all your golfing needs. We are indebted to 5-time Open Champion Peter Thomson for choosing Brora Golf Club as home to some of his cherished memorabilia in our Thomson Room. Peter was a regular visitor to Brora Golf Club and described the course as “the best traditional links course in the world” and he should know. Our staff would be happy to show you to the Thomson Room. Recently we were visited by another 5-time Open Champion, Tom Watson, who described our links as “a wonderful links golf course”. Mr Watson was kind enough to accept our offer of honorary membership. Whether it is for the history, the views, the hospitality or the challenge, we look forward to welcoming you to Brora Golf Club. You will find us an hour north of Inverness and 20 minutes north of Royal Dornoch and firmly on the North Coast 500 route.